Hey everyone, so I started working with Medium and loved it so far. I made something simple and uploaded it on FB with no problem. The second time around I decide to dedicate time on my work and when I upload it, it doesnt work. It says its uploading to Fb and it says it did but it really didnt. 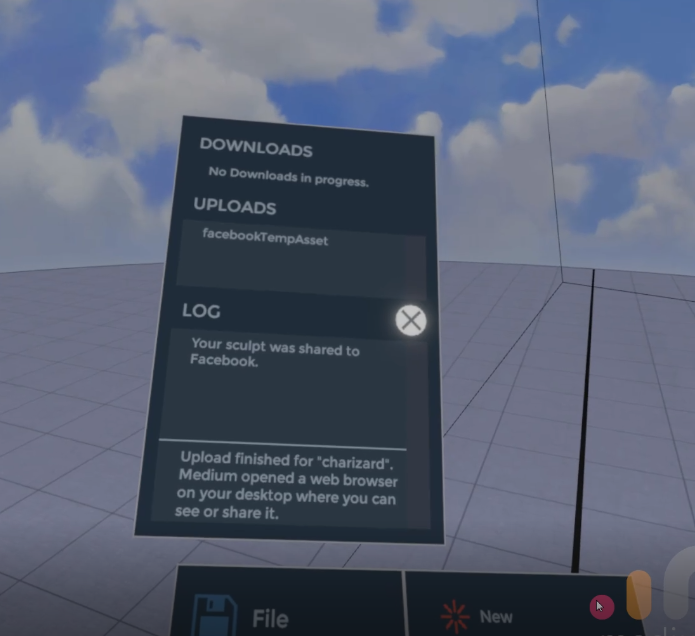 The only thing that happens is that the Oculus\Software\Software\oculus-oculus-medium-retail\bin folder opens up. I restarted, reinstalled and still get the same issue even with a model I already uploaded to Fb. Any tips would be appreciated... thanks! Hey @Rikheart, weird that your bin folder opens up. Do you mean this opens up on your in-Medium asset browser, or your file directory? I just tried this and it worked for me... Can you double check that you have internet going? If you do have internet, perhaps can you send your logs from C:\Users\yourusername\AppData\LocalLow\Oculus\Medium\log? @Rikheart! I just got this! My bin folder opened super randomly, and I got a notification that my sculpt was posted, but it wasn't. Thanks for the heads up! PS: Can you still send me your logs? @jessicazeta Hi and thanks for replying. I dont know if this is what you mean but here is the log after "uploading" to FB. (The facebooktempasset appears because I was trying again) And yes, it opens the file directory... If you need anymore information, please let me know and thanks for the help! I also tried uploading to web as you can see on the bottom of the log and that worked fine. but when I upload to FB (this or any file, even the ones that come preinstalled Medium) it just doesnt work. Thanks for the info @Rikheart. We're checking out this bug.